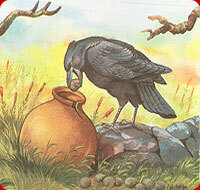 A thirsty crow once found a pitcher with a little water in it. But when he tired to drink the water, he could not. The pitcher was tall and his beak didn't reach the water. The cleaver crow thought and hit upon a plan. He went on dropping pebbles into the pitcher. The water rose up to its neck and he quenched his thirst.